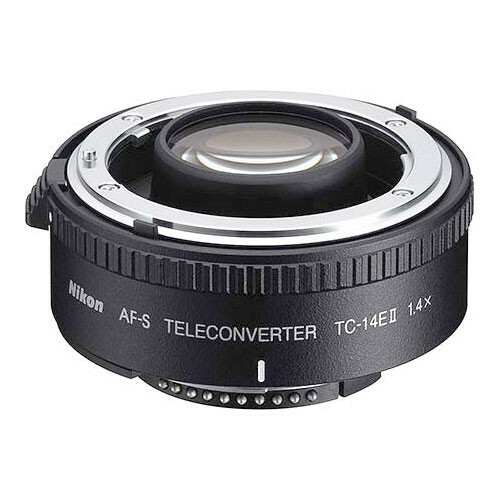 The Nikon TC-14E II Teleconverter has been updated to match with AF-S type lenses, and will maintain full metering and focusing with compatible cameras and lenses. This converter will increase the focal length of the lens by 1.4x, and reduces the lens aperture by one f-stop. Note: Autofocusing only possible when used with D1, D1X, D1H, D100, F5, F100, N90s, N80, N75, N65 AF SLR cameras, and any newer models. Please note that Nikons DLSRs featuring f/8 AF support may allow autofocus with lens/teleconverter combinations that are not currently listed as being 'compatible'. TC-14E II 1.4x Teleconverter for D-AF-S & AF-I Lenses ONLY is rated 4.7 out of 5 by 241. Rated 5 out of 5 by Gary the Birder from Super Quality TC Purchased to extend the range of my AF-S 300mm f/4D primarily for birding and other wildlife photography. Great optical quality a given. Noticeably better mechanical quality than aftermarket TC's as evident in a near zero play connection between the AF-S 300 and TC and TC to camera. Purchased to replace an aftermarket TC that had worked well with my 70-300 on D5000, but resulted in an error message and would not release the shutter with the 300 f/4 and my D5000, which I believe was do to a looser fit between the aftermarket TC and camera and lens. Hated spending the higher amount for the Nikon TC, but beats not being able to use the TC as intended. Rated 5 out of 5 by Colin from Great glass, good price, excellent value Solid, sharp, contrasty. Handheld, you will not see any difference. If shooting a test target on a sturdy tripod, you might see a difference, but test targets aren't much fun to shoot! This TC converts my 80-200 f/2.8 AFS into a 112-280 f/4 for a whole lot less weight and about a grand less cash than a dedicated 300 f/4 AFS. Like all TC'S, for a 1.4X magnification, you lose 1 stop of light. An f/2.8 lens becomes a f/4 lens. Two things to be aware of: 1. Be sure to only use it on Nikkor lenses specified for it-the protruding front elements could interfere with rear lens elements of other lenses. 2. Even if you never use body or lens caps, you will want to with this TC, because of it's design. Rated 5 out of 5 by ralphdaily from A real joy The extra reach from 200mm to 280mm is more of a help than I had expected on my 70-200mm/2.8. I can't tell any degradation, in fact images look better. I'm always racked out on my telephoto so the 1.4 is on my lens all the time. The stop loss of light is not a big deal on my D7000 or other modern DSLRs with good low light ability. Initially I missed focus sometimes but then realized I wasn't compensating for narrower DOF. So after practice my focus is good and my images are better. The Bokeh is a big improvement over 200mm. Only regret is that I didn't get it sooner, it's cheap for the value added. I bought the imported version and it was fine, I recommend it. Rated 5 out of 5 by Anonymous from Makes my 300mm f4 even better I have a Nikon 300mm f4 prime lens paired with a D300 body (DX format). Mainly photograph birds in native settings (no blinds, etc) so I handhold the lens. Needed a bit more reach as I was cropping most every photo too much. The TC-14E II did the trick giving me the equivalent of a 630mm lens (300x1.4x1.5)and I have been nothing but impressed at the ability to capture incredibly sharp images with this combination. Focus is still fast and losing 1 f-stop was not a serious problem. I can increase the ISO to compensate if needed. The teleconverter only added about 3/4 of an inch to the overall length of the camera+lens combo and so it still fits in my backpack. This product delivered as intended and I'm glad I invested in the Nikon glass. Rated 5 out of 5 by michael from HANDY TO HAVE ALONG I shot two tripod mounted, test images using the AF-S 300 f4. One without the TC-14E II and one with. The images were cropped in CS-4, so image size would be the same. Distance to subject was approx. 30ft. WITHOUT was recorded @ ISO 400, f4 @ 1/500. WITH was recorded @ ISO 400, f5.6 @ 1/125. I make no judgement as to comparable resolution, contrast, saturation, etc. You can judge for yourself. I, however, am satisfied with both. Rated 5 out of 5 by Bob R from No Compromise in Performance I use this teleconverter with Nikon's 600mm AF-S lens to photograph nesting birds. I only owned one other teleconverter in my life and it was a dog, so I vowed I would never use one again. Until this project. I really needed the extra focal length to get right inside the nests with the chicks as they were hatching out. The converter's performance astounded me. There is no compromise in terms of resolution, contrast, or autofocusing. I do find some slight darkening in the corners when shooting in full-frame FX format with my D3. But there is no vignetting with my D2X. When using the 600 on a DX format camera, this teleconverter gives you an effective focal length of about 1400mm. This combination enabled me to capture shots of chicks hatching out of eggs from a distance of more than 100 feet. I was able to clearly see details in the iris of tiny hatchlings from that distance. I would recommend this product highly to anyone! Yes, the Nikon TC-14E II 1.4x Teleconverter for D-AF-S and AF-I Lenses will work with a Nikon D5100 and AF-S 70-200mm f/2.8G II ED lens. Are the USA and imported versions the exact same quality?Where is the import version manufactured- What country? The USA and imported versions are the same exact quality. The imported and US versions of the Nikon TC-14E 1.4X Teleconverter for D-AF-S and AF-I Lenses are both manufactured in Japan. Will this teleconverter autofocus with a Nikon D300? The Nikon TC-14E II 1.4x Teleconverter will autofocus with a small sub-set of Nikon telephoto lenses that have an aperture of f/4 or brighter. You can click the link under Lens Compatibility under the Overview to view the lenses that would be compatible with no limitations. I am looking for a 1.4x teleconverter that will work with a Nikon D300 camera and a Nikkor AF VR Zoom 80-400mm f/4.5-5.6D lens that will also support autofocus. Can you recommend a model that will work? Thank you. I have a Nikon 70-200 f4 VR lens. Will the VR functions still operate correctly with this tele-converter? Yes, this teleconverter will support the VR function in the 70-200mm f4 VR lens. Will Auto-Focus work if used with D600 camera and Nikon ED AF NIKKOR 80-200mm 1:2.8 D lens? The Nikon TC-14E II is not compatible with your AF lens. It is only compatible with AF-S and AF-I Nikon lenses. Will this work with my Sigma 70-200 1:2.8 APO DG HSM and my Nikon D3S?? I really don't know cause I am usind this TC with my Nikon 70-200mm f/4. I believe you shoud ask for some one from sigma. Answered by: Priscilla Green B. How does this compare to the 14 III 1.4? I have a D610 with the 80-400 4.5 -5.6 AF-s Are both TC's compatible? Both the Nikon TC-14E II and III are compatible with the AF-S 80-400mm lens and D610. The III has a redesigned optical design with more elements in more groups. This will help with the optical quality of the teleconverter. It also has an improved barrel for increased moisture and dust resistance.